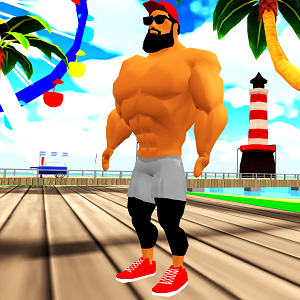 After more than 5 million downloads the world most popular bodybuilding and fitness workout game has returned and this time in 3D! Better cartoon style graphics and few more trainging program! Create your bodybuilder and go to the GYM, to be the biggest on the beach! Lets try the one of the best bodybuilding game! Lets everyone to take 5 exercise that is composed from most relevant groups of muscles. Lets play and work out with it anywhere! Choos from 5 bodybuilding workout and seven bodybuilder character. In 2015 the Iron muscle released in the google play store and apple store. The game has more than 5 bodybuilding exercises, often used weight training exercises for each major muscle group. The players can Choose from seven bodybuilder character and can custumize in the barber shop! Fitness game or fitness app? In 2016 the Iron muscle has returned with second episode with beach city and a new upgraded gym with fitness workout game! This is not a fitness app, but you can go to the iron muscle gym and do fitness trainings! Barber shop: More than 15 hair and facial hair style in 14 colours. Tattoo Studio: If reach level 3 go to tattoo studio! Restaurant: If the character tired, need some energy to bodybuilding. Choose the best food for energy and go to the gym again! Sleep: or can sleep at home. If slept enought, get a notification to phone. Working: need money on the game! If go to workplace, get a notification to your phone. Bicycle: for the best muscle shape, and six pack abs. Chest: To look like a superhero. Biceps: To have the greatest arm on the beach. Scott bench: for bigger biceps. Abdominals: Abs workout app?! No! but you can get six pack abs in the gym for your character! Squat, calf: never skip leg day. Use this game to see how the train transorm your body. It's better like a fitness app! After more than 5 million downloads the world most popular bodybuilding and fitness workout app has returned and this time in 3D! "This fitness game is awesome I loved it!!!!!!!! **************************************"
"I love it it make me happy especially in work out at Gym. Thanks for this"
"It is very best game for gym and workout app"
"Number one bodybuilding game I like in this world"
"This game is great.I like to see my bodybuilder growing but if the game will be free world it will be the bestest game of android phone in the world." "This is my favorite game as ever"